I don’t know about you, but I really love Indian henna art. I’ve never had it done because of how long it lasts. 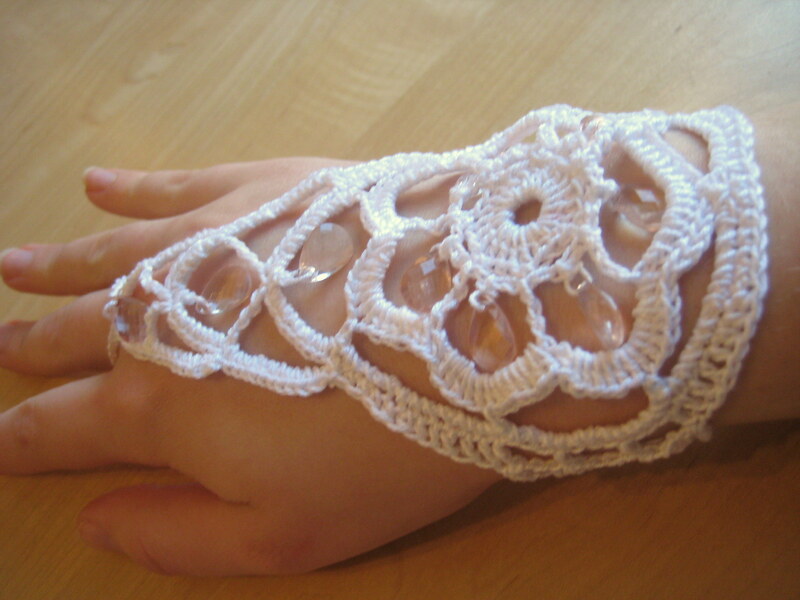 The other day it just occurred to me that I could crochet a bracelet with a similar effect – and this way it is non-permanent and I can put it back on whenever I like! I saved the pink beads from a cluster ring which broke- I think they work well with the white thread but I may save this one for more sunny weather. The colours are quite summery and I don’t want to cover it up with a pair of gloves! Motif detail – with beads! 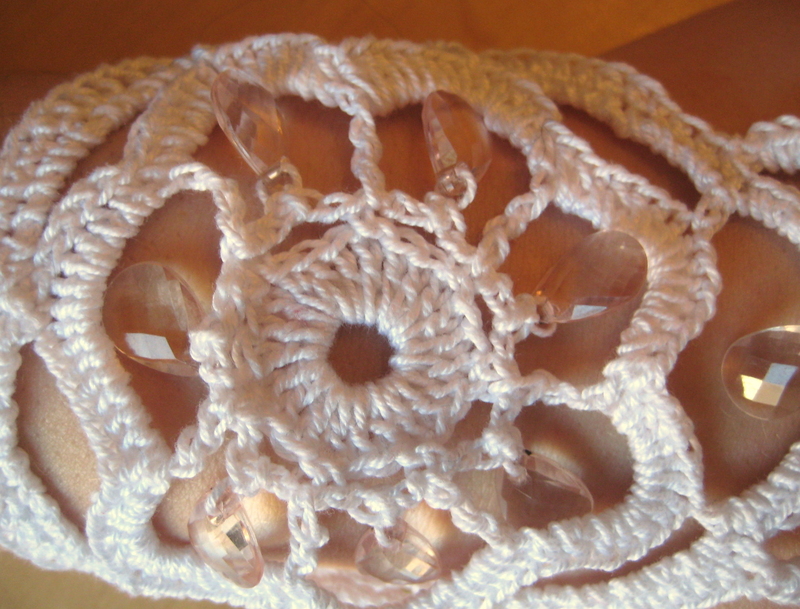 You will need crochet thread (I used Pixie crochet cotton 20, which would usually be used with a 1.5mm hook), a size 2mm hook, 3 buttons (10mm diameter) and 10 beads. My beads were teardrop shaped and 13mm long by 9mm wide. Smaller beads would work, but I do not recommend larger beads (unless you want the beads to overlap the thread. The bracelet is made in 3 stages: main motif, finishing the finger section, bracelet sides. Yarn over hook 3 times. Insert hook into st, draw up a loop (5 loops on hook). *Yarn over, draw through 2 loops, repeat from *3 more times. Start by threading all 10 beads onto the thread. Chain 7, join with a sl-st. Round 3 makes a chain around each bead. Round 4: ch 2, *14 hdc in ch-sp, repeat from * in each ch-sp around, ch 10, join with a sl-st. Round 6: ch1, * 12 sc in ch sp, repeat from * twice, 11sc in ch-sp before bead, 11 sc after, *12sc in next ch-sp, repeat from * to end, join with a sl-st. Round 7: ch1, 4sc, 4hdc, 4dc, *ch4, sk 3 sts, dc, repeat from* twice, 4dc, 4hdc, 4sc, sc2tog, ch7, sk 8 sts, dtrc (in last sc in ch sp before the bead), ch 5, slide up a bead, ch1, sl-st in 2nd ch from hook, ch5, dtrc in next st (1st sc after bead in round 5), ch7, skip 8 sts, sc2tog, 4sc. 4hdc. 4dc, *ch4, sk 3 sts, dc, repeat from * twice, 4dc, 4hdc, 4sc, sl st to join. Fasten off and weave in ends. You will have one bead remaining on the thread. 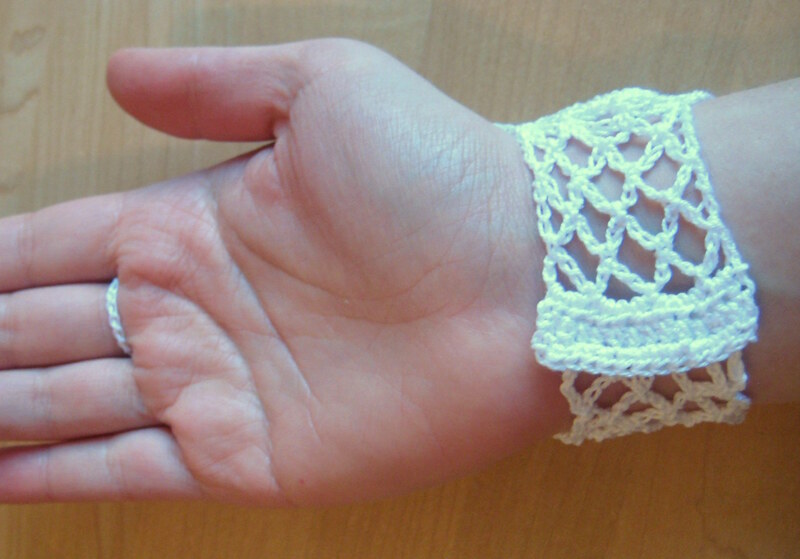 Finish the part of the bracelet which runs up to the fingers first. Join to the first sc2tog st.
Row 8: ch1, 11sc in 1st ch sp, 7sc before the bead, 7sc after, 11sc in last ch sp, join to sc2tog st in previous round with a sl-st. Fasten off. Turn the work over and join to the sc directly above the dtrc of round 7. Row 9: ch6, sk 6 sts, dtrc, ch5, slide up the last bead, ch 1, sl-st into 2nd ch from hook, ch5, dtrc, ch6, sk 6, sl-st, ch1, turn. Row 10: 9sc into chsp, 7sc before bead, 7sc after, 9 sc into last ch s, slst and fasten off. 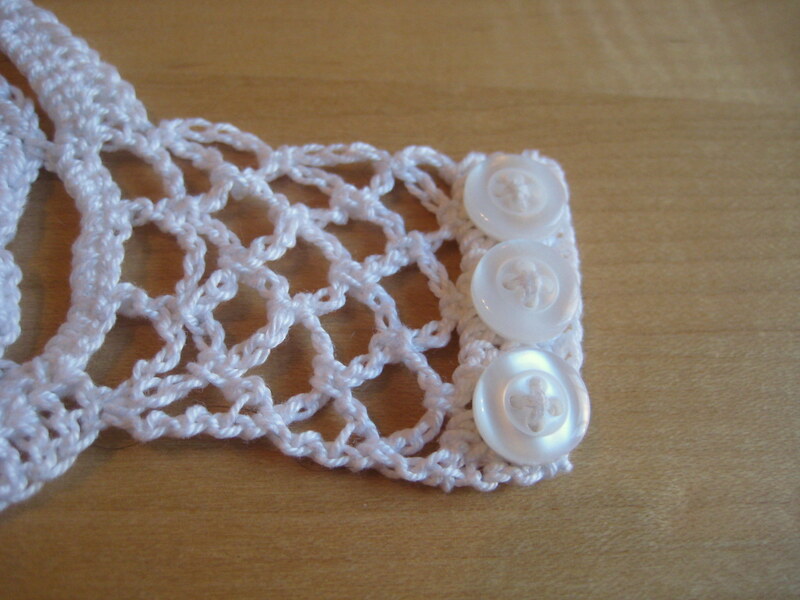 Finger loop: Join to the 1st sc before the bead and chain 26 (or desired length for your finger loop). Sl-st into next st and fasten off. Weave in all ends. The bracelet sides are joined at the anchor points of the groups of 3 chain sps made in round 7. Join at the last dc before the first ch-sp. Row B: ch 7, sl st into first ch sp, ch 6, sl-st in next ch sp, repeat from *, ch 2, trc into st where row A was joined. Row D: ch 7, sl st into first ch sp, ch 6, sl-st in next ch sp, repeat from *, ch 2, trc into trc st from row B. 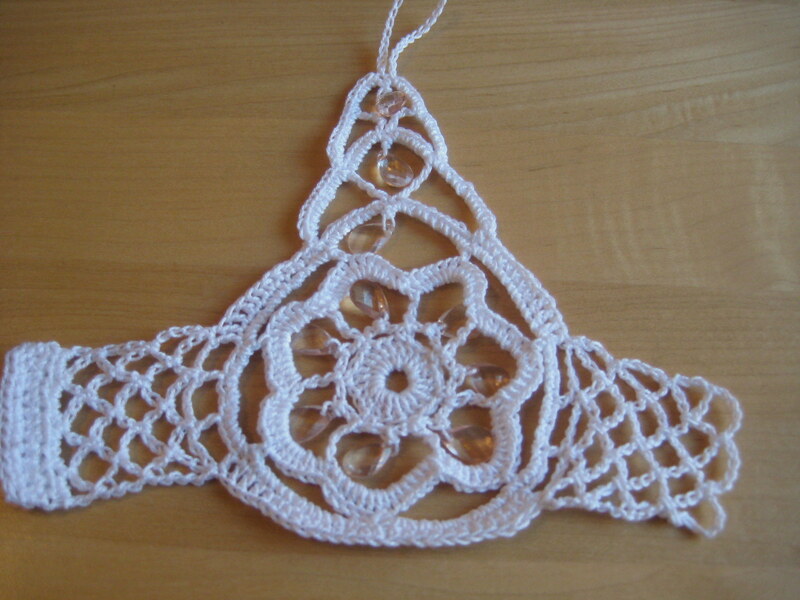 Continue to repeat row C and D, and finish with a row C when the first side is desired length (I did 3 row C’s total). Row E: ch5, sl st in first ch sp, ch 4, sl st in next ch sp, repeat form *, ch 2, dc in trc of row B below. Ch2 and turn. Sew 3 buttons onto the placket – I did mine on the reverse so they don’t show, but if yours are interesting buttons sew them on the outside. Please let me know how you find this pattern- I haven’t written anything this complex before and it is untested! Now I can’t wait till summer to wear this! Will look beautiful for a wedding. been desperately looking for a pattern that replicates henna design and voila I found one here !! thanks for this.